What better way to wrap up our celebration of the Dreamcast than by killing it off? In my final entry in this series, I’m going to do what I do best – slaughter some sacred cows. Not all of them are at the top of many Dreamcast gamer’s lists (and some certainly are), but at the very least these were well respected games that I found to be severely lacking. Grandia 2 – I absolutely loved Grandia 2 when I first played it. But I’m an older and wiser gamer, and I don’t think you could ever get me to touch this one again. 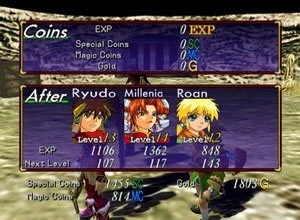 When people so vigorously defend Grandia 2, I wonder if they remember just what it was they were playing. It is practically the encyclopedia of anime/jRPG cliches. Angsty loner hero who has a tiff with his brother. Demure and gentle female lead. Sexpot second female lead. Spunky kid, big tough guy. And by the end of it all, you end up killing god. A more detailed explanation of Grandia 2 would sound like an absolute joke, but it’s all there and it’s all real. Grandia 2 has enough spark in it to impress the most wide eyed young otaku who are just branching out from Naruto fansubs. For everyone else, just try to go back and play it. See how far you can go before cringing. But what about that awesome battle system? It was an awesome battle system, wasn’t it? Too bad it fell apart slightly after the halfway point. There’s a really tough, really dramatic battle about midway or more through. It’s hard as hell and up until here the combat stays sharp. Afterwards, you somehow get strong enough to use super moves for every character on every turn, making non boss battles a waste of time, and boss battles only a matter of time. Each fight was absolutely painful, because every last thing that the combat engine did that was right meant absolutely nothing. It was all thrown out the window and replaced with the strategy of “don’t think, just go through the motions”. Factor in the fact that the endgame is a long string of boss battles, and my patience was wearing thin even back then. Grandia 2 is a highly polished and typical example of a jRPG action. Unfortunately that doesn’t say much about the genre. Dead or Alive 2 – I actually remember arguing with people in high school who honestly thought DOA2 was a better game than Soul Calibur. Their main reason was that they hated SC’s ring outs. This, in turn, meant that they simply sucked at fighting games and needed something that let them both button mash and look at jubblies. DOA2 is impressive in both its graphics and the scope and structure of its levels. I’ll still greedily use it to defend the power of the Dreamcast against early PS2 games. But that doesn’t mean I will actually play the damn thing. I’ve come to understand how the major 3d fighters work. Soul Calibur (and I mean the original – everything from 2 on is dead to me) is the balance between depth and accessibility. Virtua Fighter is the technical masterpiece. Tekken’s combos have their own weird way of working out if you understand it. Rayman 2 – I think I have laid waste to this game before, but let us do it again. 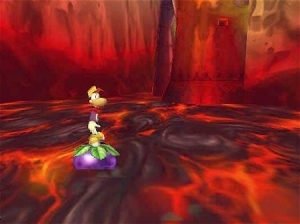 Rayman 2 is considered a definitive platformer for its time. That’s just great. I still don’t know why. It must have been competent, otherwise I would not have finished it, but here’s the problem – I can’t remember much of it. The only sections I remember are the intro, the final boss, a fire temple, and something in the middle involving a flying ship. That’s it. Anything else the game presented to me I have forgotten. On the other hand, I know many levels in Mario 3 by heart. I remember many bad platforming sections in God of War, which I didn’t even like that much. I’m pretty sure that contrary to popular belief, Rayman 2 didn’t actually have many clever levels. It was all generic platforming that we’ve done a thousand times before. Surround it with smooth, colorful visuals and you’ve got the audience in the palm of your hand. But not me. 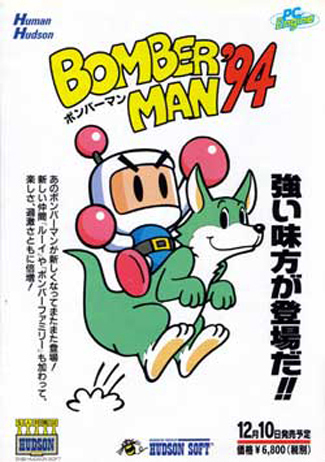 Of all the platformers out there, this one is nowhere near the top of my list. San Francisco Rush 2049 – Rush seems like a good game that tries to do too much. For example, each track has tons of shortcuts, but some of them are incredibly complex and require the absolute best in timing and precision. I like the idea of executing a shortcut requiring some skill, but it doesn’t work out so well when you can’t seem to win without them. That’s right – every race against the computer saw me smoking the other racers, except for the guy in first place, who was so far ahead of us that there was no way in hell to catch up. I’m pretty sure vehicles can be upgraded, but to do that requires that you win races. See what I’m getting at? There are also tokens you can collect, stowed away in all sorts of dark corners of the track. I distinctly remember one that was on top of the roof of a tall building which was below an even taller building my car had somehow reached. 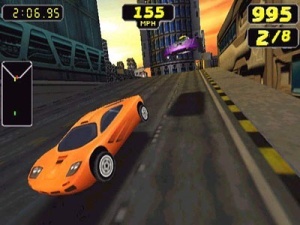 Getting down there required precise amounts of speed and maneuvering of the vehicle so as not to topple upside down. After getting the token I had to repeat the process to head back onto the track. This took about 30 seconds to accomplish, which in a race is an eternity. Am I supposed to be trying to win, or should I be trying to play platformer through the cityscape? You couldn’t do both at once, and in the end I wanted to do neither. Shenmue – Here’s the thing about Shenmue; I like it. If my disc 1 weren’t scratched I’d have played it at least two more times by now. Considering I’ve only played Ocarina of Time twice, that’s saying a lot. The reason I would do so is because it’s a fascinating experiment that can teach us a lot about what you should and should not do in a game. But that’s just it – Shenmue is an experiment. Meaning it has a lot of flaws, as well as a lot of great stuff. There are still folks that remember this one as something of a flawless masterpiece, and I just don’t get it. Did you really have that much fun walking around asking adults about where to find sailors? Did you really enjoy the beautiful town that had so little to actually explore? 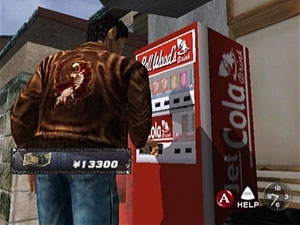 We need more games like Shenmue. But we also need to be able to discuss games like Shenmue. Let’s get on that next time. Rayman 2?!? Sacrilege! I played the third and found it pretty but otherwise not that great. I’d always just figured that, with the way people talked about the second outing, I’d come to the party after some of the magic was gone. Perhaps this is just another series that isn’t all it’s cracked up to be. And what’s this about jump attacks not working in DOA 2? I’m pretty sure the only way I was able to beat the game the several dozen times necessary to get all the outfits was by doing the crappy little jumping kick attack over and over again. Poor Tengu. He could change the seasons, but he never seemed to be able to wrap his head around people hopping a foot in the air and kicking him in the shins. Also, hurrahs all around for a great set of articles. The wavering ghostly visage of the Dreamcast is doubtlessly smiling benevelently at all of you just until George Lucas ruins the moment with fireworks and a dumb cg montage. i finished grandia and grandia 2, and my interest followed the same track both times. at first i thought the battles were fun, the stories weren’t terrible, and the mechanics were interesting. by the end i was worn down and bored. when i started the second game i actually remember thinking: “gee, i was bored by the end of the first, but they seem to have fixed everything and this should be fun all the way through.” nope. I don’t know that I agree with you on Shenmue or Rayman 2, but otherwise, it’s a perfect list.